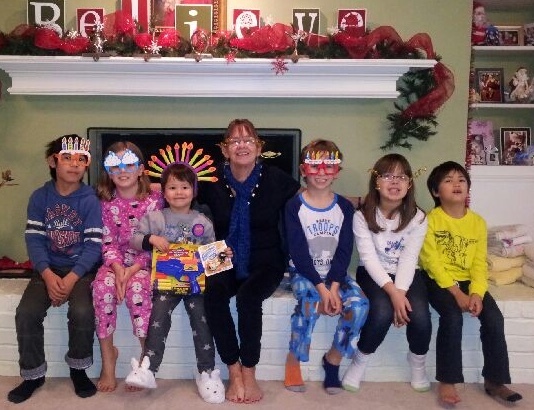 Leigh Johansen in 2015 with her grandchildren. One day when you were surfing at Onekahakaha with Leon Hallacher, you heard me yelling for help and came to my rescue and saved my life. I was just swimming like I did there so often, not realizing that there was a strong hidden undertow, and before I knew it, I had been tricked out way too far, and the waves were crashing over my head and pulling me under every time I tried to come up till I was knocked out of breath and could hardly manage to even call for help. But you heard me and got to me just in time. I would have died that day that quickly, in view of Hilo Union School where my little girl was a second grader. She would have lost her mother, who would not have ever come to pick her up. Now she is 32, the age I was when I gave birth to her. She is Dr. Lindsay Oishi, graduated from Stanford University, her PhD in Learning Sciences Technology Design. Her older sister was at Hilo Intermediate, and is now the mother of my second-grade granddaughter. I have two older sons with families, making me the grandmother of six. If it had not been for you and Leon, towing me in on your board, they would never have known me, nor I them. Thank you so much for being God’s instrument for letting me continue to be around. I’ve never forgotten you, nor ceased to praise and thank the Lord for the miracle that day, and I always think of you with so much gratitude. I should have tracked you down long before this, but I’m not much of a computer person at all, so it was just tonight that my older daughter Christa asked me, “Who was that guy who pulled you out of the water in Hilo?” and I asked her to look you up. That took her 10 seconds, and what a surprise it was to see what you have done and where you have been and ended up since 1988 or so. Wow. It certainly seems like you are living your dream. I always prayed that God would bless you and Leon extra richly for what you did for me that day. I’m a teacher too, and have enjoyed a long career of warping young minds with music, in addition to being a church organist and choir director as I was in Hilo at the Church of the Holy Apostles and Christ Lutheran. I’ve had a couple of thousand students, in school and private piano lessons, and I think they too have been beneficiaries of your more-than-good deed, making it possible for them to have a living music teacher, and not a dead one. So Merry Christmas, Happy New Year, and best wishes to you forever, and once again, MAHALO NUI LOA. And Aloha. I feel very fortunate to have been there that day to help Leigh, which I think anyone would have done under the same circumstances. As we enter the holiday season I feel especially blessed to be reminded that I made a difference in someone else’s life, who in turn is a teacher and supports her community and raised a wonderful family, who in turn is helping many others. We are all connected and touch each others lives in ways known and unknown. The sea teaches hard lessons and gives great rewards. It is up to us to learn its wisdom. Patience, patience, patience, is what the sea teaches. Brian thank you for sharing this beautiful, life affirming, story !! It’s an especially wonderful lesson to share at this time of year !! I raised my sons with the theory “Good deeds really do come back to you”…here’s a perfect example !! Brian thank you being the special person that you are !! God puts people in our live for a reason !! !